Despite the heat, Friday’s dig had a good crowd of 5 diggers and a visit from a former resident – Peggy’s bother Reg Latham – who was just 5 years old when they were forced to leave by the military. He found a short length of cast iron guttering in the bulldozed mound of demolition rubble, which was a perfect fit for the guttering brackets we found in the demolition rubble being excavated (context 72), just east of the outside toilet. The demolition rubble also yielded some fragments of lino – unexpected as none of the ‘children’ who lived there during its last decade can recall their two families being able to afford any floor coverings. It almost goes without saying by now that this layer possesed the usual few .303 catridges, and a variety of metal, glass, and ceramic fragments. Also excavated was a small sondage into the finds rich garden soil below the demolition layer (context 105). 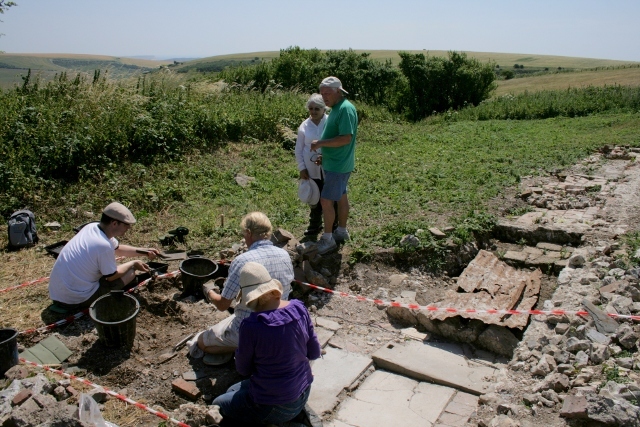 A large quantity and variety of ceramics and glass were found, as well as 2 tiny horse shoes – from a very small pony or donkey, amongst other metal finds.